Carmichael Herefords 46th Annual Proven Genetics Sale. Auctioneer Doug Dietterle with sale host Keith Carmichael and American Hereford Assn. 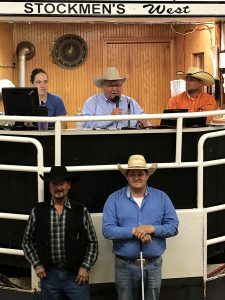 representative Levi Landers at the 46th Annual Carmichael Herefords sale. 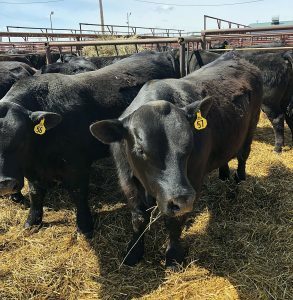 Location: Sale held at the ranch, north of Faith, S.D. 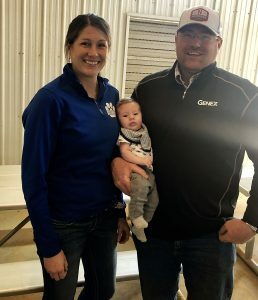 Carmichael Herefords held their 46th Annual Proven Genetics Production sale at the ranch north of Faith, SD on Feb. 21. 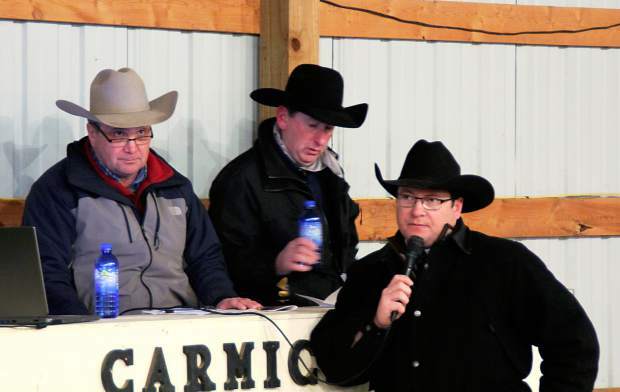 Even though the sale was held inside the heated barn, the near full house crowd of buyers could feel the bitter cold. That did not slow down the bidding though, as this was an excellent sale for the Carmichael family. 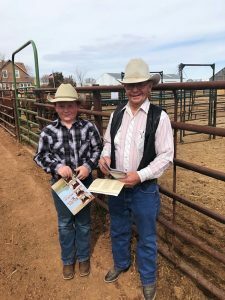 The sale ring was a fairly large pen in the middle of the barn, which really allowed perspective buyers to see the bulls travel and show their quiet dispositions. The bulls were in great sale condition, showing their natural fleshing ability with out being overly fed. This is a real sound set of bulls that should really excel in most any breeding pasture. Topping the sale was lot 8, KC L1 Domino 14083, a 4/7/14 son of HH Advance 0149X out of the very productive KC L1 Domett 04008 cow that has weaned 9 calves above the average. This bull has epds of BW 1.1 WW 50 YW 78 Milk 19 M&G 44 and sold to Roy Bell, Motley, Minnesota, for $13,000. Selling at $10,500 was lot 56, KC L1 Domino 13082, a April 3, 2013, son of K & B Thunderstruck 113Y and out of a F157K Ribstone daughter. This bull had a weaning ratio of 112, yearling ratio of 113 and epds of BW 3.5 WW 53 YW 93 Milk 31 M&G 58. 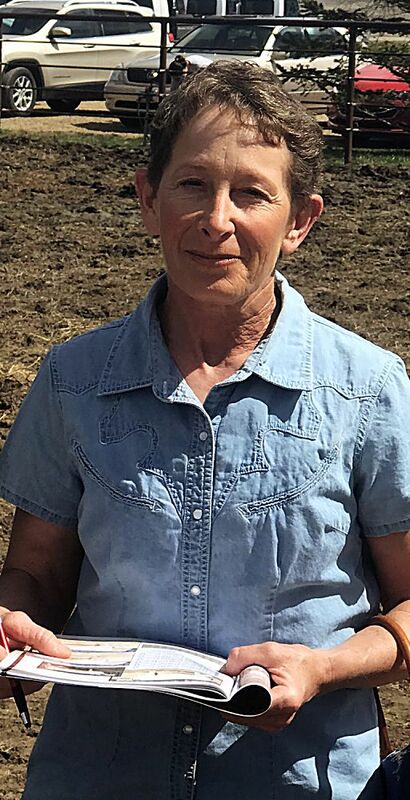 Orwick Ranch, Newell, S.D., was the buyer. Lot 29, JC L1 Domino 3024A, a April 3, 2013, son of BCC Advance 103Y with a 102 weaning ratio and epds of BW 3.0 WW 44 YW 76 Milk 24 M&G 47 sold to Bret Hanson, Faith, S.D., for $10,000. Lot 54, KC L1 Domino 13070, a March 31, 2013, son of K & B Thunderstruck 113Y sold to Hermann Ranch, Lemmon, S.D., at $10,000. This bull posted a 105 ratio for both weaning and yearling with epds of BW 4.8 WW 51 YW 84 Milk 29 M&G 54. Lot 16, KC L1 Domino 14028, a March 29, 2014, son of K & B Thunderstruck 113Y to Grubbing Hoe Ranch, Buffalo, S.D. Lot 19, KC L1 Domino 14059, a April 3, 2014 son of K & B Thunderstruck 113Y to Dwight Logterman, Kilgore, Nebraska. Lot 62, KC Ribstone 13093, a April 6, 2013, son of F 157K Ribstone 765 to Kelly Escott, Faith, S.D.